Bosnia and Herzegovina. I was staying at a bed and breakfast establishment in a quiet section of Sarajevo. I enjoyed sitting on their cement stoop each evening with a glass of wine, though I’m not sure the old man of the house appreciated my company. The owners introduced themselves as Muslims, as is the way in that area of the world, to proclaim a religious identity (Muslim or Catholic) with no scruple about not practicing the identified religion. The house wasn’t fancy, but it was functional. They had a rack of sandals inside the door because you were to remove your shoes and switch to these indoor sandals before you passed beyond the porch. It was a clean place. Somehow wearing their sandals made our relations feel more intimate. This bed and breakfast offered a cooking class, which met in the kitchen at four o’clock one afternoon. Split into three tables with four at each table, we class participants given green peppers, small zucchini, medium onions and large grape leaves. So we got up and washed and dried our vegetables, set them aside and sat down. Each table was given a bowl with ground beef; we were given careful instruction on how to add each seasoning and then mix. The lone man at my table volunteered to mix the bowl of ground beef. It looked like we were making some sort of meatloaf. Then, we were each to carefully hollow out a green pepper, peel an onion and carve a hole in the middle, take two grape leaves and slice a zucchini the long way and scoop out the seeds. 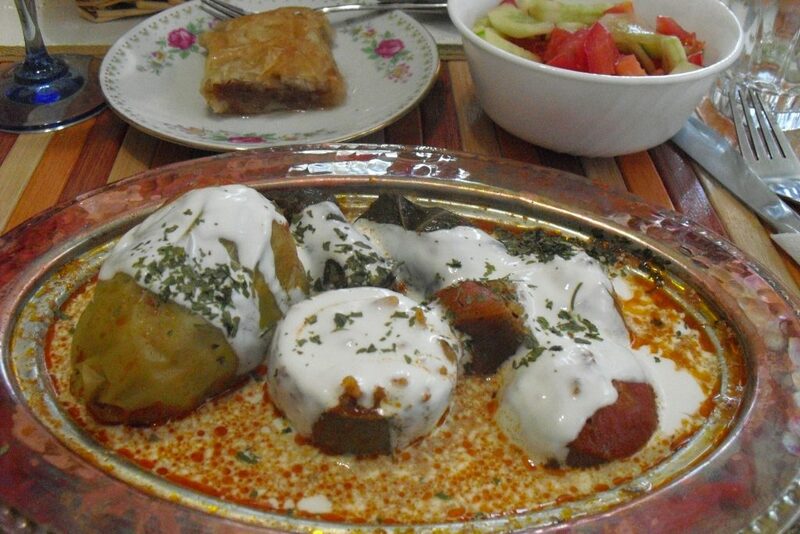 Next, we stuffed the vegetables with the beef mixture and wrapped some of the beef in the grape leaves. Each table was given a low casserole dish with diced tomatoes, and we were to place the stuffed vegetables in the casserole dish. Then the dish was whisked away and we set about cleaning up. I was wishing I had worn rubber gloves for the exercise. We sat down and chatted while being served a seasoned fruit drink. When the casserole was returned, we watched as a portion of each vegetable type was placed on our plates. Then she returned to put dollops of sour cream on top of each plate. The food tasted very good. The Australian across from me mentioned how she would have to make this for her vegetarian daughter to which her companion replied, it’s all meat. I laughed because I had lost sight of this as well. It seemed like we were eating a plate of vegetables but there must have been three cups of meat per plate! I still have the recipes.